There is a place on the West Coast of the United States where the surf dream is alive, where you can walk barefoot to all of your best friends’ houses, chill on the front porch swing with a cold brew before heading a couple of blocks away to the crashing waves, only stopping for a waffle cone of blueberry cheesecake ice cream along the way. The place is called Ocean Beach. Located on the northern edge of San Diego, close to the airport and Sea World, Ocean Beach is a counterculture haven you didn’t know existed, glossed over with a millennial sheen so even if you aren’t a sun-kissed surfing god, you can still get your beach culture on in the form of cheeky sidewalk restaurants, locally-owned gift shops bursting with sea treasures, and bars where the only care in the world is whether your beer is full or half-full. This thriving neo-hippie community is held in place by a long pier that seems as if it was once a sinuous sea snake, staked in place by tall wooden legs. Walk along the sea cliffs here with your dog, lover or headphones and start plotting which home overlooking the ocean will be yours. Girls with shaggy dresses sell bundles of sage, lost teenagers strum found guitars, and dozens and dozens of black-suited surfers bob along on the baby waves, waiting their turn to carve some glass. Babies play under bright blue and yellow beach umbrellas and sun worshippers lay on red beach towels getting as pink as the polka-dot bikini top they just untied. Visiting San Diego sometime soon? 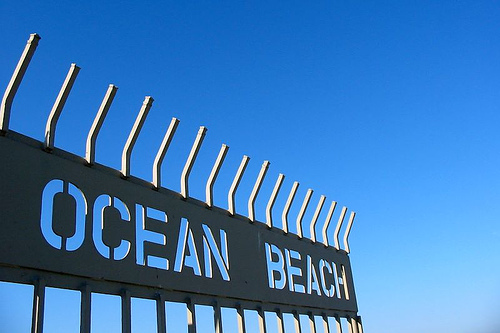 Don’t forget to stop by Ocean Beach, but don’t plan it out too much- this is the perfect spot for a lazy day. Categories: Los Angeles & California | Tags: ocean beach, san diego | Permalink.